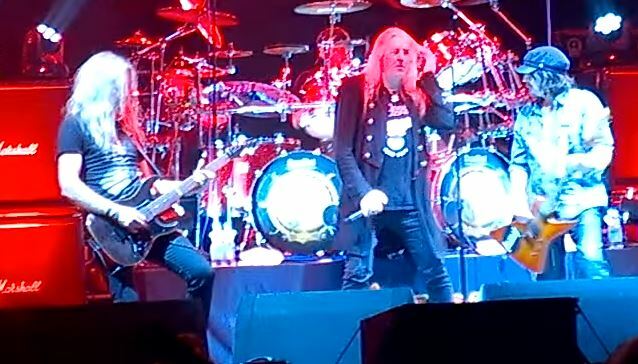 The Metal Hammer Golden Gods Awards has brought together rock behemoths SAXON with Phil Campbell and Mikkey Dee of MOTÖRHEAD to play a special one-off set of Lemmy's favorite SAXON songs and MOTÖRHEAD classics in a unique "Salute To Lemmy." Lemmy was, and will always be, one of the godfathers of rock. A renegade, an innovator, an icon and an inspiration, there is no doubt that the world of rock would look very different today if it wasn't for him. "A Salute To Lemmy" is a unique celebration of the man himself. SAXON, one of Britain's greatest rock bands — who in their own right have sculpted and inspired the world of rock today and have influenced generations of bands — will perform a one-off live set with Campbell and Dee. The Eventim Apollo (formerly Hammersmith Apollo) is a new venue for the Golden God Awards and the perfect venue for Britain's salute to Lemmy. The venue is staunchly part of MOTÖRHEAD's history — the band's "No Sleep 'Til Hammersmith" live album reached No. 1 in June 1981, 35 years to the month of this year's awards. Biff Byford of SAXON says: "Lemmy was a great friend and he always supported our band — as we did MOTÖRHEAD — through ups and downs. We were touring with them until he died, so to be able to honour him at the Metal Hammer Golden Gods is a great opportunity to say goodbye." 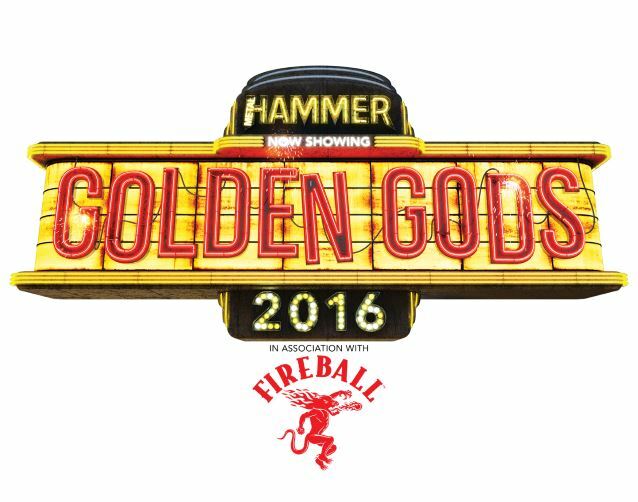 This year, TeamRock and the Metal Hammer Golden God Awards are teaming up with Pinewood Live to film the event. Pinewood Live is part of the Pinewood Studio Group, a leading provider of studio and related services to the global creative industries, synonymous with world class British and international film and television productions. Billy Watson, director of Pinewood Live, says: "Pinewood Live is delighted to be involved with this momentous anniversary for the Golden God Awards. Capturing the event for posterity and distributing the show around the world is a great way to celebrate Lemmy's music and contribution to rock." "The Metal Hammer Golden Gods are about more than those who we honor on the night," says Alexander Milas, editor in chief of Metal Hammer magazine and TeamRock executive director. "It's about letting the proverbial hair down and partying with the readers who've supported us for all these years, and the first act we're announcing for the night is sure to be emotional. 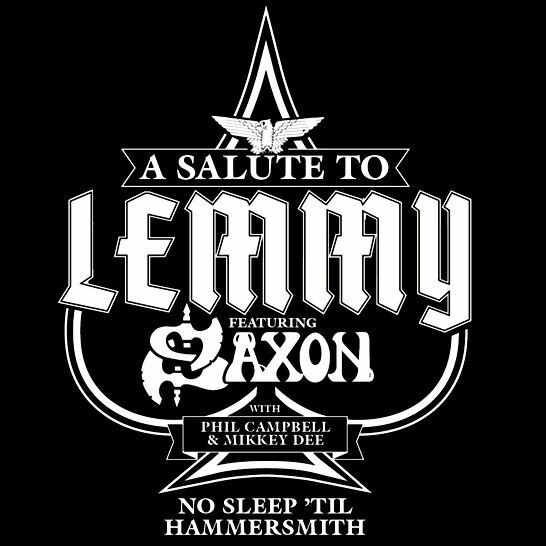 A salute to Lemmy Kilmister with SAXON and MOTÖRHEAD's members Phil Campbell and Mikkey Dee is going to bring the house down, and means that June 13th will be one for the history books." "Any movie fan will know that Pinewood is a mark of quality," says Milas, "and Pinewood Studios have hosted some of the greatest films of our time, from 'Star Wars' to 'Superman'…. the list goes on and on. To be working with Pinewood Live in their latest venture to immortalize the Metal Hammer Golden Gods is more than an honor. It's two institutions working together to break new ground and we guarantee you won't see anything like it." Tickets are available to buy now for £6.66 at www.eventim.co.uk/goldengods. TeamRock and Eventim UK, the official ticketing partner of the Golden Gods, will donate all profits from ticket sales to the charity Heavy Metal Truants, an annual charity cycle ride sponsored by TeamRock from London to Download festival to benefit Nordoff Robbins, Teenage Cancer Trust and Childline.